Itanagar, May 5 : The All Arunachal Pradesh Student's Union (Aapsu) on Monday said Union home minister Rajnath Singh has promised to look into its demand for withdrawal of the Armed Forces (Special Powers) Act from Arunachal Pradesh. An Aapsu team called on the minister at his New Delhi residence on Sunday and submitted a memorandum on the matter. 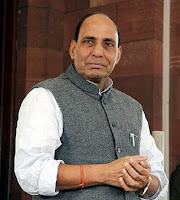 While the notification regarding the extension of AFSPA in nine districts (besides Tirap, Changlang and Longding) of the state has been kept in abeyance, Rajnath will discuss the issue with Union MoS for home Kiren Rijiju and a decision will be taken based on his (Rijiju's) wish and interpretation, Aapsu quoted Rajnath as saying in a press release on Monday. President of the organization Kamta Lapung informed Singh that the strict customs of the tribes of Arunachal prevent illegal activities from taking place and, hence, the AFSPA is irrelevant there. Coordinator of North East Students' Organization Pritam Sonam said, while the people of Arunachal are thankful to the Centre for inducting Rijiju as a junior minister, it is unfortunate that the AFSPA has been extended in a state that is an island of peace, the release added.